Blogcleaning: Follow-Up, Book Review/Giveaway, and Smoothies! Thanks, also, for the ideas and links about how to exercise for the greater good (see post Exercise and the “Greater Good”). Carla suggested people who eat right and exercise serve the greater good by not costing the National Health Service (Carla’s from the UK) a fortune on obesity/sedentary-lifestyle-related illnesses. The costs are staggering. A USA Today article quoted a Centers For Disease Control statistic that reported “Americans racked up about $75 billion in weight-related medical bills in 2003.” And that was six years ago. I can only imagine what that number is now. Carla also doesn’t own a car and walks wherever she can. Several of you mentioned playing with children. Definitely exercise for the greater good! Not only in terms of the emotional outlet and bonding fun, but modeling active behavior for children in this age of little or no recess or gym classes is vital. Thanks, Zentient, for the link to Keep It Simple Bike-Blended Soap. The soap is literally made by people peddling a bike. I’d work for them for free! Pamela shared a Mother Earth News story about how Ed Begley, Jr. uses a bike to generate energy around his house, like 10 minutes of peddling for a piece of toast. The caloric trade off would mean you could add some jelly or sugar and cinnamon! There are links in this article to other pedal-energy sites as well. Next, if you happen to walk past a book store any time soon, go in and find Joy Bauer’s new book, “Joy’s LIFE Diet,” and turn to page 240. I think you’ll recognize the face J. I’m one of several people who have lost more than 100 pounds through diet and exercise Joy has featured throughout the book. Most of the people have been inducted into the Today show’s “Joy Fit Club,” and while I was asked to become a “member,” we haven’t been able to find a time that works for Today or me just yet. Stay tuned. I’ll let you know if/when that happens. LIFE stands for Look Incredible, Feel Extraordinary. Joy offers sound advice on eating and exercise. Pretty standard stuff. Nothing scary. It is definitely a diet I would have followed while losing. She also includes several tasty-looking recipes (I plan on trying the stuffed Portobello mushroom caps this week). If you’re looking for a no-nonsense plan or just a slight change of pace from what you’re already doing, pick up a copy of “Joy’s LIFE Diet.” If anything, the stories will inspire you. I mean, 232 pounds? Holy wow. And there are several people like that in the book. Leave a comment and win a copy of Joy’s book. I’ll announce a winner on Friday. Finally, smoothie love. My husband bought me a Cuisinart Hand Blender for Christmas, and I’ve been in smoothie heaven almost every morning. My smoothie basics are: 1 cup of frozen fruit (no sugar added), ½ cup of soy milk or Almond Breeze, ½ cup fat-free Greek yogurt, and ½ tsp stevia. Here’s the best part. No two smoothies are ever alike! Some days I use raspberries, blackberries and strawberries. Other days I throw in peaches or frozen bananas. I use vanilla soy sometimes, chocolate soy sometimes, flavored Almond Breeze, plain Almond Breeze…you have dozens of possible combinations. Once in awhile I’ll throw in a tablespoon or two of my beloved PB2 powdered peanut butter. It’s really good with the chocolate soy milk and strawberries and bananas. Smoothies are so easy to mix up with the hand blender, too. Very little clean up and I eat the smoothie right from the mixing cup. No frills, and it’s cheap, too. Smoothies, particularly with Greek yogurt, are a great source of protein. Perfect before or after a workout. I think that’s it. Just wanted to get caught up with ya’ll. Don’t forget to leave a comment to win Joy’s new book and a comment over on the Q&A to win Jennette’s book. This entry was posted in Uncategorized on January 26, 2009 by Lynn Haraldson. I’ll love to get a copy of Joy’s new book. I watch her segments on the Today show and the success stories are inspiring. one of my favorite (all time best) yoga instructors used to walk into class with a mason jar (lid on) as a glass for her morning smoothie – perfect for the car or class – no spills. One morning she walked in – no smoothie – and we asked about it. She said she had not been to the store and her only options were black olives and green peppers – so no smoothie. please do put my name in for the book drawing – looks like a good one. How fun that you are featured in this book – I would LOVE LOVE LOVE to win a copy!And the smoothies sound really good – I will have to get some Almond Breeze and make one. Oh, and some PB2. And frozen fruit. But hey, I DO own a hand blender, so there’s that! I look forward to seeing you on Joy’s segment! 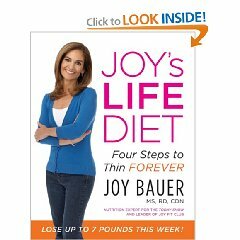 Joy’s Life Diet sounds like a wonderful compilation of helpful information and stories to inspire. I would really love to win the copy! Those smoothies sound awesome. Keep up the great work! Hey Lynn! I’d love to win the book. I am always scouring Amazon for weight loss books. They are so inspirational. I’d love to win a copy of Joy’s book. I love smoothies too. I always put some protein powder in mine too. I always have one before going to the gym to keep my energy up. I make mine in my magic bullet which is great because you make the smoothie right in the cup which is very conveinent. Man I sound like a commercial lol. Mmmmm smoothies! Yum-o. Love “mother earth news” and wouldn’t mind figuring out that pedal for your toast contraption. Thanks for sharing! I just sent you an e-mail about Ed Begley and his exercise bike (note to self…read the latest post before opening mouth!). Oh well! I have watched Joy on the Today show and love her philosophy on eating real food that is good for you in correct portions as opposed to the whole “look how much fake cardboard food I can eat for only 100 calories” (I guess that makes it obvious why I only lasted through 2 WW meetings!). Please enter me in the drawing for her new book! Thank you Lynn for the continued inspiration! Id love to read this book.and to finish my book.and to get a nap some day.but Id more like to read Joys book 🙂Miz. i would love to win! I watch Joy luck club all the time!! Would love to read this boo! I’ve heard good reviews. I love books like this with inspirational stories. I hope we get to see you soon on tv again! I’m Carla from the UK–I’d just like to clarify that my husband has a car, but I don’t, and I don’t have driving licence either, although I’m trying to get one. So I’m walking! I love Joy Bauer Food Cure Book and would love to win the LIFE Diet book! And you’ve inspired me to make a smoothie for breakfast tomorrow! Pick me, pick me! I need some inspiration. Wow that is awesome so I am curious…Is that added “pressure” to receive all the press? How do you balance that? Sort of interesting how we used to hide behind our large bodies and now your thrusted into the limelight showcasing your Body! Total opposite! How AWESOME does that make you feel? Thats almost too much to wrap myself around. Thanks for sharing Joy’s story. 232 pounds! I can’t even imagine. And how brave she is keeping herself in the public eye. Inspiring how she handles the pressure. That sounds like a great book, but have a look around Amazon for it. Oh yeah! Enter me, too. I’m always up for another good read.